Devotion to the Blessed Virgin Mary : In this ceremony, the priest on behalf of the bride seeks the blessing of Mary through prayer and the laying of flowers. The Lazo (Lasso) : The tradition of lasso is prominent in the Hispanic culture and other Asian cultures. As per this custom, a wedding rosary is made and wrapped around the couple's neck which signifies the unification of the couple. After offering prayers, at the end of the ceremony, the rosary is given to bride as a memento for becoming the mistress of the house. The Arras : Arras is the small box containing thirteen, either, gold or silver coins. These coins represent Christ and his twelve Apostles. The groom gifts the Arras to the bride promising to financially support her always. And bride promises to use the finances wisely. Exchanging Rings : Exchange of rings is a common practice performed in catholic weddings. This tradition signifies the bond that is made between God and the couple by performing this ritual. Only the finger on which the ring is placed has varied from time to time. Earlier, it used to be the thumb but nowadays the ring is placed on the third finger on the left hand. 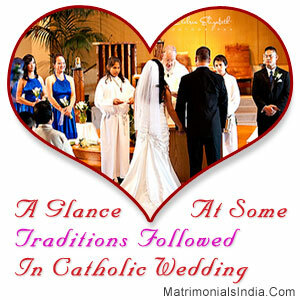 The customs & rituals performed during the Catholic Wedding have deep rooted religious connections. All these customs have ingrained meanings associated with them. All these customs and rituals lend a sacred touch to the whole affair & make it more memorable.